…I still don’t like THE SLAP. I’m sure I have been asked several dozen times at least in my 44 years some variation of “how can you read so much crime fiction…isn’t it depressing and full of horrible murderers?“. From now on my response to that question is going to be “maybe, but not even Ken Bruen has written a book that paints as unrelentingly grim a picture of humanity as Christos Tsiolkas’ THE SLAP. Now, on a second reading, I don’t really have much to add. The reason I read it again is that I recently heard an interview with the author that gave me pause. The interviewer asked Tsiolkas what it was like spending so much time with such horrible people and his answer was that he didn’t find them horrible, they were like people he knew. I wondered if I’d been too harsh. Perhaps I am harsh but if these are people Tsiolkas knows then I feel sorry for him. THE SLAP is populated the most repugnant collection of fictional people I have ever met (and most books I read have at least one cold-blooded killer in them). The adults are all some combination of violent, alcoholic, superficial, philandering, racist, whining, juvenile and, self-absorbed. They drink to excess, take whatever drugs they feel like whenever they feel like it and swear endlessly. For all that they are banal. The story is like an alternate negative image of the TV show Neighbours. Like the show in this version a small group of people live too much in each other’s pockets but here the people seem to wake up each morning with only one guiding principle: what can they do today to hurt themselves or their loved ones? Between the beatings and the cheating and the feeling trapped and deciding to forego friendship and principles in return for a lifetime of abuse there’s not a healthy adult relationship in the bunch. And I suspect this soap opera is about as realistic as Neighbours. Maybe I have my head in the sand as I don’t recognise much of my middle-class Australia in these people.. Though to give Tsiolkas his due he does bring the characters alive very well, I just wish he hadn’t bothered. If you watched the TV adaptation of THE SLAP (I couldn’t bring myself to) do tell me how they handle the swearing. I was trying to imagine how on earth they could truly claim to have captured the essence of this book without every third word being f*** or c***. This entry was posted in Christos Tsiolkas (Aus), musings. Bookmark the permalink. I still have no intention of reading this for a first time, let alone rereading it. I feel the same way. I had no interest in the subject or the characters. Bernadette – I read all the fuss about this when it first came out. Wasn’t tempted then and am certainly not tempted now…. Was not tempted to read this or see the TV series which recently aired here (UK) to rave reviews. I sometimes wonder about professional TV reviewers, I think their brains have become addled by years of rubbish because the odd time I start to watch something universally raved about, I almost invariably switch off after 15 mins. Perhaps the author would have done better to have taken a more satirical approach, along lines of Claudia Pineiro in Thursday Night Widows – characters in a gated community who weren’t nice but who were funny to read about. But I have read too many US books about this kind of suburban emptiness where people don’t do anything worthwhile with their lives to make me interested in reading this – I’m grateful to you for the second read as I had begun to waver a bit. PS meant to mention that in some ways the reception awarded to this book reminds me a little of the inexplicable (to me) commercial success of Before I Go To Sleep (in the UK). Also now set for a film, I think. Omigosh! Thanks for this review. I’ll avoid this book like the plague. You were brave to reread it, I appreciated it in parts but didn’t like it much either. People seriously overestimate the grimness of crime fiction compared to other kinds of contemporary fiction. I haven’t read The Slap, and it sounds incredibly tedious, but I might have to flip through it just so I can borrow that great response the next time someone asks me why I read so many mystery novels! A book can certainly be boring if there is no dead body in it. 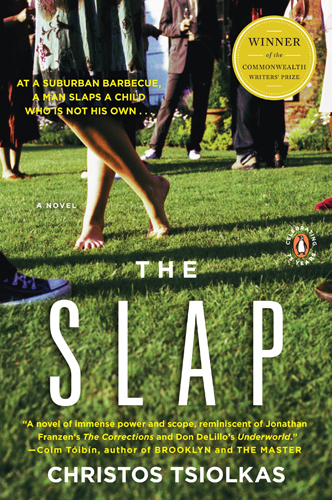 And The slap was recomended to me by my very well read crime fiction reading friend. I missed the tv show and will also give the book a miss. Thanks for the heads up.. I beg to differ with you all on The Slap – and not just because the author is a close personal friend. I think Tsiolkas shows us a side of contemporary life that while we may not like it, we would be naive to think doesn’t exist. Most of the characters might be unlikeable (I have a soft spot for Richie and empathy for Manolis and even Rosie). But their voices have a place in contemporary fiction. The parallel with Neighbours is interesting. Christos said that when he was growing up, he longed to see faces like his on TV. But there were no wog families on Ramsay Street. The Slap put diversity on TV and I for one am glad for that. I don’t think it’s necessary to like the characters in order to feel for them, nor to admire the excellence of the writing and the innovative structure of the book. Just my opinion. And you can never have too many opinions!